It was really just a hockey game. Certainly it was the biggest hockey game of the National Hockey League season, but the riot it has spawned in Vancouver makes it look like something far more politically charged may be the cause. And Twitter is playing a big part in reporting this riot, and may even be able to help local police catch some of the culprits. The riot erupted as soon as the final horn sounded to end game seven of the Stanley Cup final, where the Boston Bruins defeated the hometown Vancouver Canucks 4-0. The Twittersphere was filled with updates about the game throughout the evening, and once the rioting began one could see tweets monitoring the situation for hours afterward. Twitter users were sending messages outlining what was going on in the downtown core, from cars being lit on fire to where police were having standoffs with rioters. They also offered opinion on the whole situation, ranging from disgust that news outlets were calling the rioters “fans” to embarrassment for a city that hosted the Winter Olympic Games just last year. This isn’t necessarily new to Vancouver. 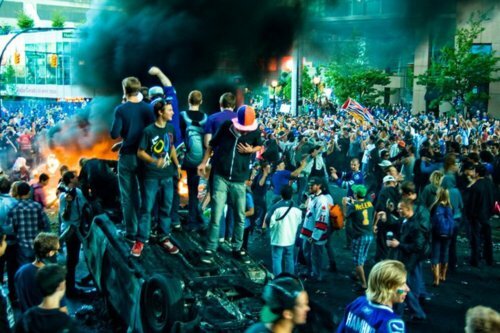 In 1994, a riot started when the Canucks lost to the New York Rangers in the Stanley Cup finals. But this time, social media platforms like Twitter are around to help people report the situation immediately and maybe even provide authorities with clues as to who is involved in the rioting. Savvy users are taking photos of rioters and are sending them to news agencies and the local police to help them identify those doing the damage to the city. Of course, many of those who are causing the problems are also taking photos of themselves, which may eventually find their way into authorities’ hands. Twitter may have also prompted the story to gain coverage well beyond the borders of Canada in such a speedy manner, as CNN, the New York Times and Washington Post have all moved the story to prime coverage areas of the outlets’ websites and print editions. And NBA star Steve Nash, a native of British Columbia, took to Twitter to plead with rioters to stop with the onslaught. Vancouver please stop burning s–t. We’re a great city and have a lot of class. Our team is great and our championship will come. Soon. There have been rumours also circulating through the popular social media platform about the current situation in Vancouver, with one update even reporting two deaths. Nothing of that nature has been confirmed as of yet, although local hospitals have reported several injuries of varying degrees. The early reports of stabbings and deaths further illustrate that the Twittersphere is prone to rumour and conjecture, so it still is not the most reliable source of information on such matters. Facebook may also wind up playing a huge role in figuring out who was involved in the riot, as many digital camera and phones were used to take photos of those participating. It is very likely that authorities may gain access to these images to aid them in finding out who should be charged for being part of the chaos in Vancouver (that was, again, it must be said, the result of a lost hockey game). A Facebook community page, called “Vancouver Riot Pics: Post Your Photos”. It has received over 5000 “likes” within 30 minutes, and is set up so that those who are tagged in photos of the riot scenes can be easily found by news organizations and, more importantly, police. A Facebook group is organizing a cleanup of the city, with over 2000 members and counting. A Tumblr site has been set up with photos of those caught in the act (a sample image is below). Each and every one of these sites are being spread through Twitter, with even media outlets picking up on them and spreading the word through more traditional means with the hopes of Vancouverites getting involved in the effort to claim back their city. The hashtag #riot is the primary one being used by those on Twitter that are following the Vancouver riot, and it may also help police track down those involved in the chaos.